A field is often regarded as a permanent and unchanging entity. In one sense this is correct, but if the grass is regarded as a crop, it is obvious that it is temporary and must be managed properly on a seasonal basis. 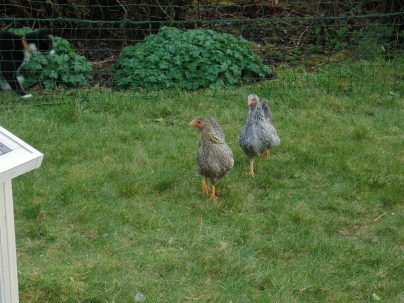 As referred to earlier, chickens cannot be allowed to range on the same piece of land indefinitely; otherwise the grass will deteriorate, there will be a gradual increase in the incidence of pests and parasites, and the flock will succumb to health problems. 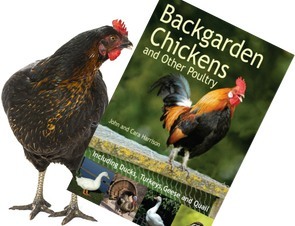 ADAS recommends that chickens should generally be moved to a new area of vegetation every 4 to 6 weeks, if a system of paddock grazing is used. With a moveable house this poses no great problem; it is simply a matter of transporting it by hand or tractor, depending on its size, and re-erecting the pasture control fence of electric netting around the new area. Where only a small number of birds are kept in a house with combined run, it may be more appropriate to move it every day or every few days. If the flock is ranging in numbers well below the official limit and has a considerable expanse of pasture at its disposal, it may not be necessary to move it as frequently. For example, a house may have a field on either side of it, with these two areas being used alternately. It is a question of relative scale, stock density and common sense, but with a commercial unit, the ADAS recommendation is a good general guide. Where fixed houses are used, the birds’ access to new grazing is more difficult to arrange, but a portable electric netting fence is an effective means of controlling the flock”s ranging once it is outside.